Yesterday morning I woke up after a long, disturbing dream--one of those in which nothing is going my way, I can't get people to cooperate, and I just feel frustrated and angry. To top things off, in the dream some girl (I'm talking teenager, not little kid) punched Ethan in the face, after which I destroyed her. Needless to say, I had a bad case of the grumpies. But Ethan was angelic. He wanted to cuddle, gave me several kisses, and the little bird's nest of his hair healed my ailment. I think I've mentioned it before, but our neighborhood was built on an old horse farm, so the trees are clumped together in small copses rather than spread around; we have a copse in our backyard (which has been named "The Poo Woods," thanks to Cody), but no trees out front. Actually, few people have trees out front (unless they've planted saplings). One thing that sort of kind of maybe a little makes up for the relative lack of mature trees is the azaleas. 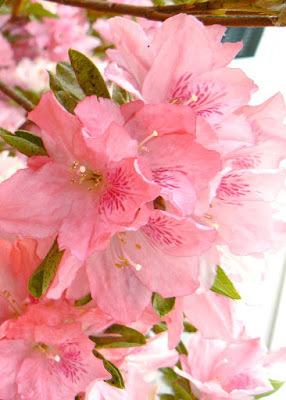 They thrive in these here parts, and we're smack-dab in the middle of azalea blooming season. We haven't had to do anything to coax them along or nurse them into blooming; every year, they burst their happy blossoms on their own, painting the neighborhood brilliantly pink and fuchsia and white and red. Our pink and white azaleas have started to bloom, and I noticed them as I buried my nose in Ethan's fragrant hair one last time before buckling him into his car seat. Yesterday was a pretty terrible day at work, in which 25% of our office personnel were laid off, all of them my friends. When I picked Ethan up at the babysitter's house, they were sitting in the yard, and I joined them, appreciative of the sun and the breeze and the cherubic quality of my little boy as he played in the grass. 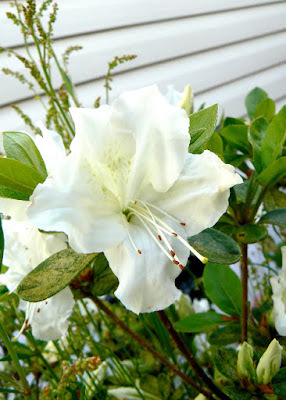 When we arrived home, the azaleas greeted us, fully outstretching their coyly ruffled petals, unaware and uncaring that their season will soon be over. Beautiful. Ours are getting close, but not quite there. Hope tonight's dreams are peaceful and tomorrow's a better day. 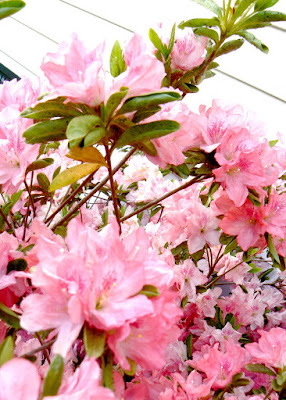 Ooo, pretty azaleas! Thanks for your welcome to police life over at my blog. I've been reading through your blog and cracking up quite a bit. I enjoy your writing. I would love to add you to my police wife links if that's okay with you. Saw you over at Mrs. Fuzz's place. Glad to meet another LEO wife. We've been married 20+ years and he's been a LEO for 14-15ish? Although computer forensics now (HURRAY!!!!) and a regular schedule. FINALLY.